When visitors land on a web page, they may or may not notice the many calls to action on the page. If you want them to notice the “Sign Up” or “Contact Us” buttons, you’ve got to catch their eye with visually appealing buttons or popups. These buttons can find a place anywhere you like—in the sidebar or the footer or as an insert on any page or post. The popups can be made to appear after a specific time interval or when the visitor is about to exit the page. We’ll look into these WordPress call-to-action plugins in this post. Calls to action are a great way to aid conversions. When a visitor is looking for a way to do something on your site, such as to purchase a product or to ask a query, you must make it easy for them by highlighting the option as a prominent button. If visitors have to search for the option on your website, they’ll most likely move away to a competitor’s site. Calls to action can persuade a visitor to complete a transaction by guiding him with visually appealing buttons, prominent notification bars or popups. Calls to action are totally necessary on a landing page to get visitors to do the one thing you want on these pages. Keep in mind that neither visitors nor Google take kindly to annoying popups. That being said, a popup that’s not too intrusive can get you the action you want. Exit intent popups are better options as they do not interrupt a visitor’s navigation on your website. Bright and bold call-to-action buttons are also effective, and so are instructions in a notification bar. Some plugins that are designed for specific purposes, such as newsletter plugins or social sharing plugins, also include calls to action. If you wish, you can use MailChimp email templates to increase subscriptions. However, this post is mainly about plugins whose main function is to add any call-to-action function to your site. WordPress Calls to Action helps you add beautiful calls to action from a new tab in the menu without any coding knowledge at all. It bundles in a few call-to-action templates, so you don’t really need any design skills to use this plugin. It is developer-friendly, and you can create as many additional templates as you want. Using a visual editor, the call-out box can be customized for background color, dimensions, text content, and color. You can view the changes before you hit update. After you’ve created the call-to-action button, you can insert it in any page or post by clicking on an option in the post editor. You can insert multiple call-to-action buttons and insert buttons using a shortcode as well. The call to action can be anything from a button to click or a popup form to fill out. Besides, you can add call-to-action buttons in the sidebar as well if you want the action to appear globally on your site. A dynamic call-to-action button can place a button on the sidebar of specific pages or posts. The plugin lets you monitor and track conversion rates and clone and AB test your buttons to improve your marketing. It gathers lead intelligence and works well with the WordPress Landing Pages and WordPress Leads for this purpose. With the help of the Simple Side Tab plugin, you can add a vertical tab to the left or right side of the browser window. The tab is sticky and stays in place even as the visitor scrolls the page. The tab is always visible and works fine on mobiles, too. By adding any text to the tab and by linking the tab to any piece of content you like, you can use it for increasing conversions on your site. Using filters, you can modify the text output as well as turn the tab on and off conditionally. From the settings page of the plugin, you can choose the text that will go into the tab and the fonts to use. You can also specify the internal or external URL to link to and choose the colors of your tab elements. The tab is built with CSS for easy customization. One of the most popular free call-to-action tools is Hello Bar. Hello Bar lets you create not only a top bar but also a modal popup, a full-page call-to-action, or a triggered slider box. To use Hello Bar, you’ll need to visit their website and use a cloud-based tool to create and customize your notification bar. Then, simply paste the generated code into the plugin. Without doing anything further, your call to action is added to your site. The plugin helps increase your conversion by linking directly to items of interest. It also collects emails for product updates/newsletters and increases social network interaction. What’s more, it does all this without needing any coding skills on your part. Hello Bar helps promote your content with Facebook, Buffer, LinkedIn, Pinterest, Google Plus, and Twitter. Hello Bar is also capable of simple A/B testing. One of the best things about Hello Bar is its clean user interface that helps users to create and customize. It offers a number of settings that you can adjust—email addresses, social media, and A/B testing. Almost everything can be personalized, and you can select the pages on which the bar is to display. It’s a great fit for time-sensitive campaigns as it includes a field for the date range. Before you pick this service, you need to be aware that their free plan rather restricts the number of interactions. Further, your bars will carry the Hello Bar branding. To increase the number of interactions and to remove branding, you’ll have to go with the paid plans. The Image Widget is a simple plugin. It uses the native WordPress media manager to add image widgets to your site. By simply adding a link to these image widgets in your sidebar, you can lead visitors to take action. You can link the image to any page, such as a contact page or a subscription form. The plugin is responsive and multisite compatible, and it can resize and align images. 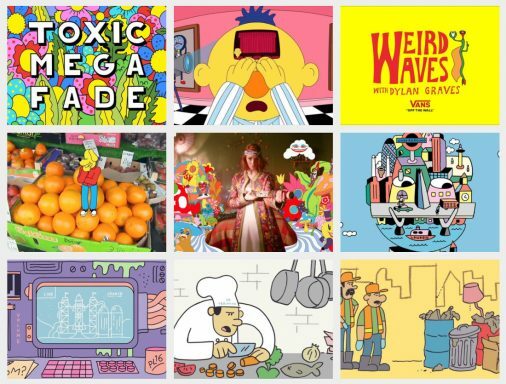 You can select images from media library, upload images, or link to an external source. It allows you to add the title and description and to customize the widget. The Image Widget Plus supports multiple images, lightbox, slideshow, and random images. MailOptin is a multi-purpose WordPress call-to-action button plugin for boosting your subscribers’ list. In short, it is a lead generation tool that will help you collect more emails for your upcoming campaigns. Simply add it to your website and see the magic happen. In fact, it actually is a simple as it sounds. However, the bigger your website, the more impact MailOptin will have on it, resulting in more captured leads. Anyhow, even if you are just starting out, you should not miss building a loyal community right off the bat. Although MailOptin offers a Lite version, the features are still numerous. Speaking of which, you get popup optin forms, page level targeting, sidebar forms and you can create unlimited forms as well. That said, test a ton first and see what works best for your audience. You know, when you are just about to leave a website and a popup appears, grabbing your attention. If executed cleverly, you will take action and, if poorly, you will want to leave as fast as possible. With OptiMonk, the former will be the case for you, winning over even more leads than you did with any other technique you used before. OptiMonk is a WordPress call-to-action plugin that creates neat exit popups and fantastic on-site retargeting. One thing is for sure, you will definitely not distract and annoy your guests too much. Rather keep them engaged and hungry for what is coming next even more. With OptiMonk, you get five different on-site messages, like popups, sidebars, nanobars and lucky wheel popups to name a few. Moreover, OptiMonk also includes loads of different triggering options, over fifty impressive templates, drag and drop builder and a variety of targeting options. Some of the goodies Popups includes are the ability to show popup only on exclusive pages, posts and whatnot. Nope, there is no need to have it featured across your entire online space. You can also filter users who never commented, via roles, those who arrived via another page on your website and even search engines-related users. The options are there, you just need to put them into play. You get loads of different call-to-action options when picking Icegram. This outstanding free WordPress plugin makes sure that you get the most out of your website visitors. You can introduce them to your world with a wonderful welcome bar, announce big news in a popup and capture their emails. Icegram is as versatile as it can be, offering you a variety of benefits that will skyrocket your online business through the roof. What is super cool about Icegram, just like any other WordPress call-to-action button you find in this collection, it requires no coding. That said, even if you are with zero experience, it will still be a small breeze setting up Icegram and all the perks it comes with. You have all the action bars, popups and toast notifications under full control. Social Media Share Buttons and Social Sharing Icons is a plugin that lets you add share icons for RSS, email, Twitter, Facebook, LinkedIn, and Google+. You can choose from among 200+ social media platforms. Not only that, it allows you to upload your own custom share icons. These buttons and icons persuade a visitor to like or share content. The range of options that this plugin offers is truly wide. You get to choose share icons from 16 different designs. A single social media share icon can have multiple actions. For instance, the Facebook icon can lead visitors to your Facebook page or can act as a like button. To help make the icons more noticeable, you can add animation effects to them. You can also choose to display the social share buttons and the social share icons at the end of every post and customize the buttons as well. You can choose to make the icons sticky and add counts to the social media buttons. For a higher level of attention from visitors, add a popup asking visitors to follow you or to share your content. The plugin is easy to use and needs little configuration on your part. Simply follow the steps directed in the plugin. The premium plugin adds many more social networks, offers more design styles, and lets you place the icons on specific pages alone. It also offers more popup options and is optimized for mobiles. MailChimp Top Bar is an add-on for the MailChimp for WordPress plugin. As the name suggests, it adds a beautiful top bar to the top of your WordPress. Although it’s called a top bar, you can add it to the bottom of your site as well. It’s rather unobtrusive, and visitors can dismiss the bar at will. PopupAlly comes with many customizable templates. It lets you create popup forms with exit intent and popup forms after a timed delay. It also lets you embed a subscription form at the bottom of your posts. You can display it horizontally right under your header. The free version of the plugin works with Aweber, MailChimp, and many other email marketing services. The pro version gives you much more control over design and allows you to create any number of forms and popups. It allows you to track statistics and split-test the results. You can choose from many different types of call-to-actions, such as click to open, show different popups on different pages, or blog categories and video popups. 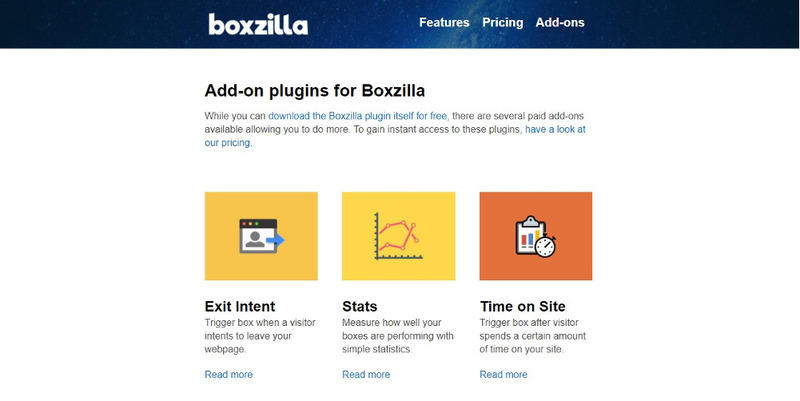 Boxzilla is a popup call-to-action plugin that allows you to create boxes that pop up or slide in and out at preset triggers. They can appear on any screen position that you choose. You can use it for any call to action, such as a MailChimp sign-up form, social sharing buttons, or Read More options. The time on site, exit intent, percentage of scroll, number of page views, or a manual click can all be triggers for displaying the box. The box editor allows you to enter just about any content in the boxes from simple text to more advanced HTML or even shortcodes from third-party plugins. After you have created the content for the box, you can customize the appearance of the box from an intuitive interface. The plugin is available for free download from the WordPress plugin repository. To use the add-ons and for priority email support, you’ll need to go with one of the three monthly plans. The price for the plans varies from $6 to $14 per month. The add-ons cover the exit intent, page views, and time on site triggers as well as the option to hide boxes to people who have already subscribed. It also offers integration with WooCommerce, stats, and Google Analytics. Bloom is a call-to-action plugin that’s geared toward increasing the number of email subscribers. This email opt-in plugin can hep you convert casual visitors into loyal followers with highly targeted content. It allows you to place calls to action in specific posts or pages. Also, you can display country-specific unique offers using special forms depending on your level of interaction with visitors. More than 100 design templates are available, and each template is customizable to a great extent. Also available is a large selection of opt-in types that you can display on multiple locations on your website. Using the plugin, you can create popups and set triggers for these popups. Besides popups, you can also add fly-ins and set triggers for them, too. Moreover, creating and adding inline opt-in forms are easy. Simply configure your forms, generate a shortcode, and place it exactly where you want it within the content in the post editor. You can also add the opt-in forms at the bottom of your content or in the widget areas. Bloom doubles up as a plugin to restrict premium content. You can set it so that users have to fill up the opt-in form before they can access the premium content. When it comes to triggers to set off the opt-in forms, you have a choice from timed delay, percentage of scrolling, or reaching the bottom of the post. You can also trigger the forms to appear after a period of inactivity, after commenting, or after purchasing. Bloom integrates well with many email marketing tools, including AWeber and MailChimp. For advanced users – not tech-savvy – Inline CTA Builder is a great option to customize call-to-action buttons accordingly. Out of the box this WordPress CTA plugin comes with a whoppin collection of forty templates which you can utilize as is or improve further. The options truly are outstanding when using Inline CTA Builder. To get the hype going, you can choose from simple text CTA, text with image, text with video, duet CTA template and others. Thanks to the drag and drop technology and great customization functions, you will quickly set things up for your blog or business website with Inline CTA Builder. You will also find four different button link types and enjoy full compatibility with WordPress themes, Visual Composer and Multisite. Needless to say, Inline CTA Builder follows all the latest trends and standards to make sure your website continues operating without a hitch. Another feature you can add to your websites is a floating/sticky side tab. You can use it for social media, to redirect users to a particular blog post, newsletter subscription, promoting products and other whatnot. And to realize it, all you need is Easy Side Tab Pro. 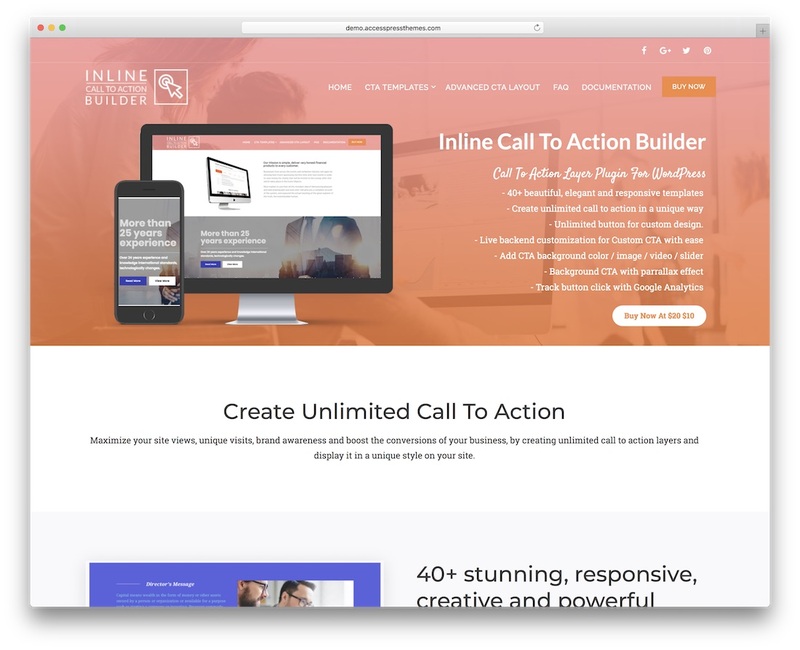 This cracking WordPress call-to-action plugin is ready for all the ideas you have, making sure that the end product is as effective as possible. You can select from ten different templates and four tab positioning. In brief, there is something for everyone. Additional functions of Easy Side Tab Pro are choosing internal and external links, an option to disable or enable on mobile, as well as using text, icon or both. Moreover, feel free to modify default settings and make your side tab follow your branding regulations precisely. For everyone in need of additional assistance, the friendly support team is at your service 24/7. 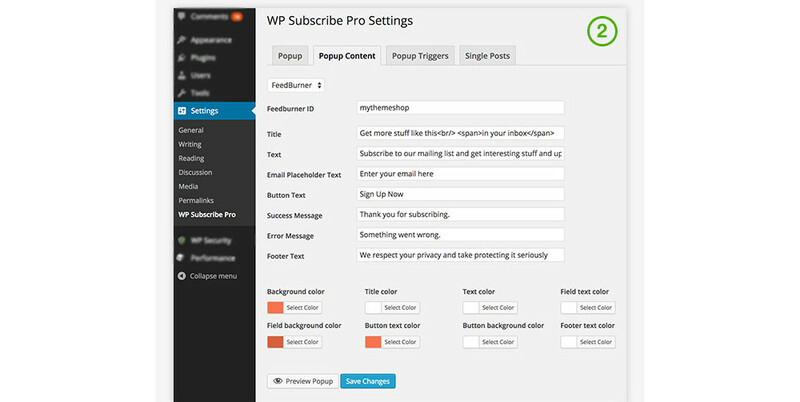 WP Subscribe Pro is a great tool to help you achieve your internet email marketing goals. It allows you to display fully responsive and SEO-optimized forms anywhere on your website without using any code. You can customize the box as well as any widget in which the forms appear and set it to exclude pages and posts. It allows you to choose the triggers for the display of the subscription box as well as the animation effects to be included. You can add custom HTML and use shortcodes in the popup box as well as control the text within the popup. A helpful preview button lets you view all the changes you make before going live with it. The flush and expiration cookie allow you to show the subscription box to all subscribers, including those who have already subscribed. This can be helpful when you have something new to add to your button. The plugin includes support for FeedBurner to manage your site feeds with Google feed management services. It also supports most major email subscription services, like AWeber, MailChimp, and MailPoet. Calls to action are great for improving conversion rates as well as user engagement. They not only help to reduce bounce rates; they also help to boost revenues and achieve your marketing goals. The plugins on this list can help you to add effective call to functions easily and in an unobtrusive manner. Let us know your experience with them in the Comments below. I used Simple Side Tab, it’s nice because it’s so simple. I just wish they could let you create multiple buttons and control their positions, as is it only lets you create 1 button. I love hello bar! Thanks so much for posting these!